There are some countries I am content to "see" only through books and movies. Afghanistan is one of them. 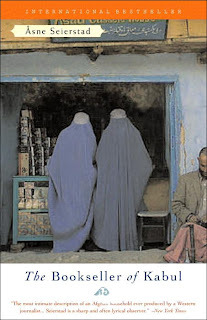 Often books about a country make me want to visit, but The Bookseller of Kabul by Asne Seierstad had the exact opposite effect. Although the culture she describes is fascinating, I prefer to learn about it from the comfort and safety of my living room couch. Seierstad is a Norwegian journalist who entered Kabul in 2001. She had been in Aghanistan for six grueling weeks, following Northern Alliance commandos through mountians, desert and steppes as they moved against the Taliban. After the grimy adventure, she happened upon an oasis in the country's capital city - a bookshop where she found it "refreshing to leaf through books and talk about literature and history" (ix). Although the books were interesting, she found their owner, Sultan Khan, to be an engaging storyteller, a veritable "history book on two feet" (x). Seierstad made him a proposal: If he allowed her to live with his family temporarily, she would write a book about him. He agreed. Thus, began her 3-month visit with a family she describes as typical in some ways, not in others. As Seierstad began her stay, she observed the pecking order in the Khan Family: Sultan ruled his multi-generational family (his household included his mother, his sister, 2 wives, and his own children) with an iron fist. His sons did not attend school, but worked in their father's bookshops, despite their own dreams. Women had even less choice - they remained home, cooking, cleaning and waiting on the men. Sultan's word was law. No one dared oppose him. The man, himself, was an enigma. He had risked his life to save books from destruction by Kabul's religious fanatics, and considered himself open-minded on the subjects of education and women's rights. Yet, he denied his own children opportunities to learn and made sure all of his women were kept in their proper places. The book shifts its focus constantly, highlighting different members of the family, who in turn represent various sections of Afghanistan society. Trying to sort out the names and relationships of all the individuals will make your head spin, which must echo the reality of living with a dozen or more people in a cramped city apartment. There is Rasul, Sultan's eldest son, who resents having to work for his demanding father. He takes his anger out on his aunt, Leila, who is only 3 years older than him, but the lowest creature on the Khan Family food chain. Then there is Mansur, also crushed under the thumb of his father. He desires only to get an education and see the world, but his future has already been carved for him. Leila's is the most tragic situation - as Sultan's younger sister, she is the family's slave, working tirelessly for the men who torment her. When a young suitor sends her love notes, she becomes excited, but terrified. If Sultan finds the notes, she will be beaten as contact between unrelated men and women is strictly forbidden. Her marriage will be treated as a business deal between the men of her family and her fiance's - she has no say in the matter. As these decisions are made, she feels "how life, her youth, hope leave her - she is unable to save herself. She feels her heart, heavy and lonely like a stone, condemned to be crushed forever" (282). Through the various members of the family, we are given an intimate and troubling portrait of Afghanistan. The country emerges as a weary land, sagging under the plague of endless war and greedy leaders. With the possible exception of Sultan, all members of the Khan Family appear deeply unhappy with their lots in life. Afghan men, especially, are portrayed as cruel hypocrites - men like Sultan welcome progress on one hand while holding their wives' and daughters' heads under the water with the other. To me, and I think to Seierstad, this dichotomy is one of the most intriguing and odious things about Afghan culture. I found this book to be many things - fascinating, compelling, disturbing, heart-wrenching, depressing - but it offers an unparalleled look inside a society that is notoriously closed to outsiders. Like all glimpses into other cultures, the book helped broaden my world view, and like any trip abroad, it made me realize once again how blessed I am to live in The United States of America. For this, if for nothing else, it is worth the read. **Don't forget - I'm giving away my copy of this book. All you have to do is leave a comment on this post and I will enter you into the drawing. I will draw a name on February 25, so entries need to be in by midnight on the 24th. Good luck! Only comments on Bloggin' 'Bout Books (not Unread Authors challenge blog) will be considered.